After uninstalling the program lets you choose whether you wish to delete all its settings from the registry and the log files. 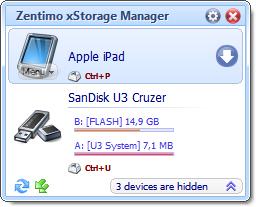 In most cases the device icon for non storage devices were assigned to a flash drive icon. Now that’s fixed and the program tries to recognize type of the device and assign a proper icon. In some cases the device settings cannot be stored on the device. The command line tool didn’t work. The program might display “cannot connect to service” error after its installation on Win 7 64 bit. The option “Power off the device after device stopping” was reset to default state after the program reinstalling. 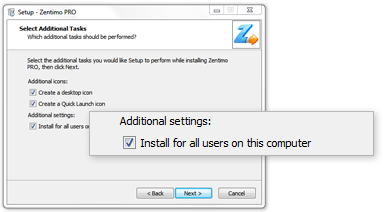 Some program settings weren’t transferred from USB Safely Remove into Zentimo during installation. Devices connected to external USB hubs might get duplicated in the device menu. The program shows an awkward message on attempt to load the icon for device in an unsupported format. The tray icon can be hidden when the option to hide icon was enabled even though there was devices to be stopped. Autorun after insertion of media card into card reader didn’t work if the option “Hide drives without media” is enabled. When autorun process is launched with “Close/Kill process before device remove” flag the process couldn’t be closed/killed if it’s launched for a card reader’s memory card. In some cases the program cannot be unloaded if there is a process launched by its autorun feature. The program displayed an error after closing manually an auto launched before device stopping process. The Autorun feature. The %PhysicalDriveName% command line parameter was given a wrong value. The program recognized some external drives as “Composite USB device” and didn’t see their drive letters. The program didn’t remember the selected language during the installation. The program is under constant development so if you have any ideas, notes or found bugs feel free to let us know! The file for Zentimo final 1.4 downloaded from your web site is corrupted. I’ve just tested it and it seems working fine. It seems that your connection with internet broken and broswer cached the corrupted file. Please try to clear browser’s cache (see here) and download Zentimo again. your soft disconnect HDD fixed ? Is most cases it does, however sometimes System prevents to disconnect devices. We work around it. Glad to get the update. Thanks. Easy install. Never noticed any issues indicated in the Bug fixes, but what I fail to understand is how the latest release, 1.4 was available on various web sites 3-4 days before it was posted here. Is somebody leaking the new releases before they officially become available? Thank you for the question. The version which was available on various web sites actually wasn’t a release as we’ve just now finished testing it. I guess pirates found it in our uploading directory of web site. That version was only for testing and we gave it to some user to test. I just tried to extend my subscription for another year and was unsuccessful.Why? I will most certainly not pay the full price. Looking forward to your excuse. I’m sorry, but your 1 year upgrade subscription is finished at 27th of July. You can stay with previous version of Zentimo or extend your subscription. It is impossible to purchase maintenance renewal until the 2011, January 1st because we started to sell Zentimo in July 2010 therefore you cannot have a license with an expired subscription. I thought to days date is the 31-08-11. Michael, sorry it was our mistake. We’ve just fixed it. Could you please try again. If you still have any problem please feel free to notify us on support@zentimo.com. Thank you for the report of bug. We will investigate it and try to help you as soon as possible. Please send us email about the issue to our support (support@zentimo.com). We will let you know if we found a workaround of the problem. Hiya,I am very pleased to have had the command line tool fixed so quickly!My wireless USB dongle can again be stopped and returned back (to fix wireless connection) =DThank you very much!! The Internet is available version 1.5.1.1187. What is it? That is small bug-fix. Zentimo couldn’t install on Windows XP 64. The bug was fixed in version 1.5-beta1. Ach! I should’ve read the comments before sending out a note to support about XP x64. Will await a newer version then. A previous GAOD offer can be used for upgrade to 1.4 version? Thanks! Excellent product! Hi. I install Zentimo in Windows 8 Developer Preview and works perfect. But the feature “Power off the device after device stopping” (Options -> General -> Device Power Management) is disabled. I try Windows 7 compatibility with administrator rights but still not work.Can you verify and fix for future versions plis?Thanks! Thanks for posting here. We didn’t test Zentimo in Windows 8. So it might hive some compatibility problems. We will change it in future version of the program. Is there a forum / discussion board for this product? Unfortunately, no. We will think about a forum. Cant you just add a sub-forum to safelyremoves forum? I see that version 1.4.1.1190 has been released. Are there any changes? or release notes? The Digital Signature of the download is expired. Won’t prevent functionality, but prevents proper validation. The USB Safely Remote demo digital signature is valid though. Just desinstall Zentimo Pro received from last GAOTD. It has worked fine (XP sp 3), until I connect my GPS Tomtom Go 730. Zentimo loads it, but Tomtom Home don’t recognize it anymore. BTW, it was not possible to leave a message after desinstall or to let a message on the site. I have a license for version 1.4. I recently had to reformat my hard drive. Now the registration key doesn’t work.